There was only a brief glimpse of the female Kestrel today as she passed across Buck Hill, headed west towards the Round Pond. 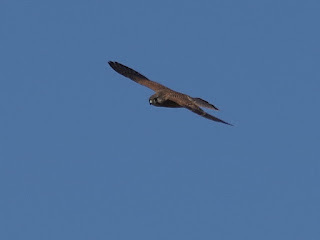 Probably she had been hunting over the Meadow, the wild area across the road from Buck Hill. 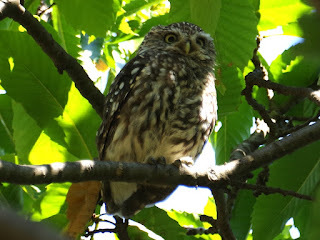 But the elusive Little Owl at the leaf yard obligingly moved on to a branch where he could be seen clearly. 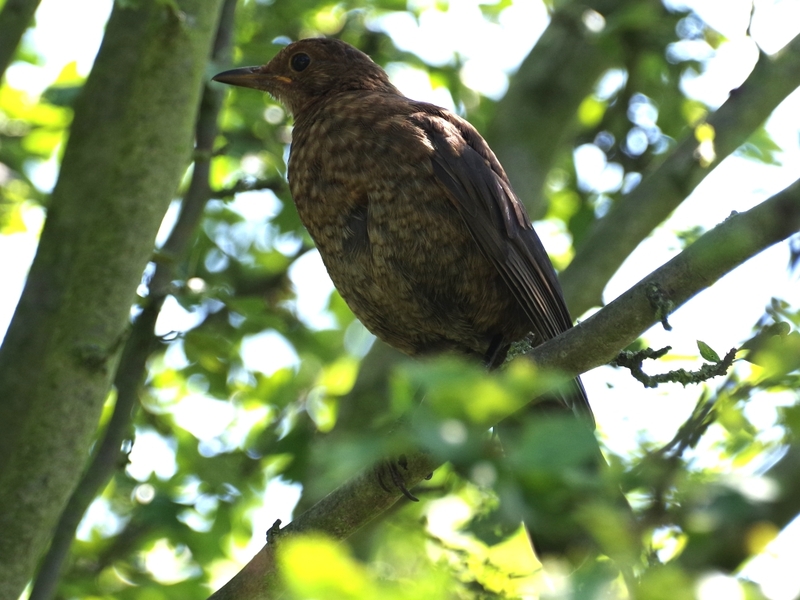 A young Blackbird perched in a tree beside the Long Water. They are much the same colour as adult females, but have an indiscriminately speckled pattern while a female has clearly defined spots like a Song Thrush, though much darker. 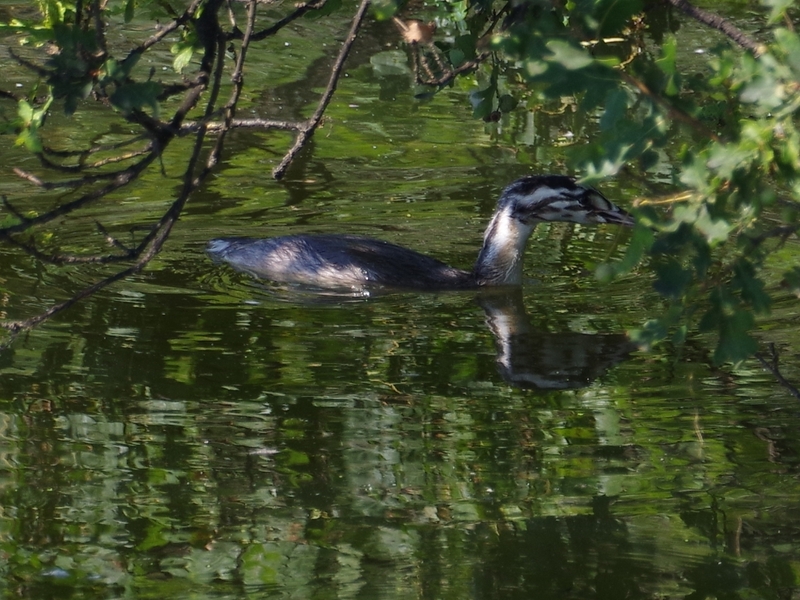 The four Great Crested Grebe chicks from the fallen poplar are now quite large and there is only room for one of them on its parent's back. One of the three older chicks from the family near the bridge was pecking at leaves on an overhanging oak branch. 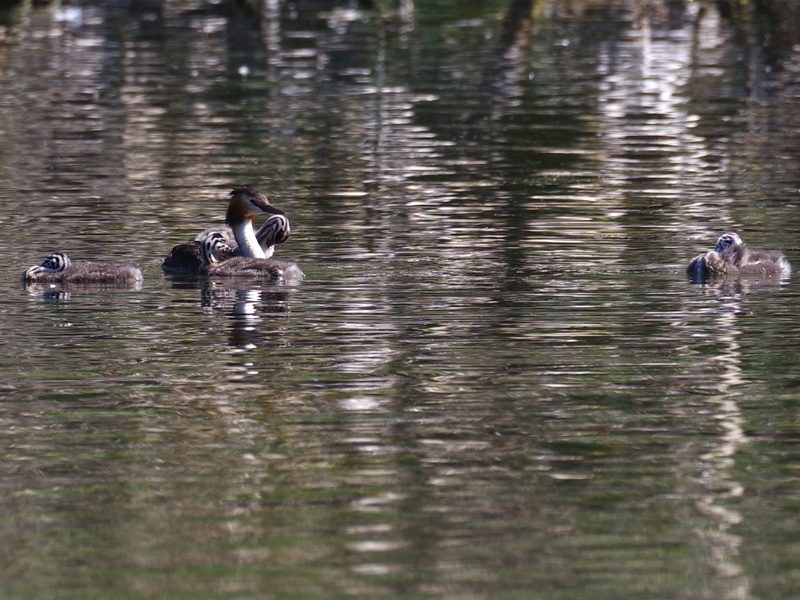 Grebes eat insects as well as fish and other aquatic creatures. The Coots at the Serpentine outflow are still looking after the chick that fell down the weir, in spite of their nest having been destroyed. 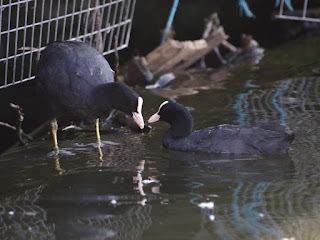 One of the parents arrived with a larva and passed it to the other to take down to the chick -- something that Coots often do, as if one parent, presumably the mother, was in charge of feeding. This picture shows the water flowing over the weir and the sloping plank which the chick could perfectly well climb up, though it shows no wish to do so. 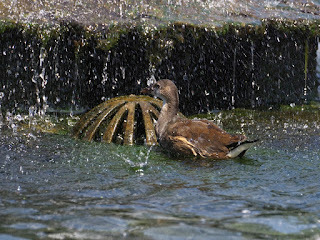 A teenage Moorhen on one of the Italian Garden ponds got thoroughly drenched under the fountain. ... and that the youngest Canada, also accidentally adopted and still smaller than the others, has fully developed wings and is well able to keep up with the others when they fly. 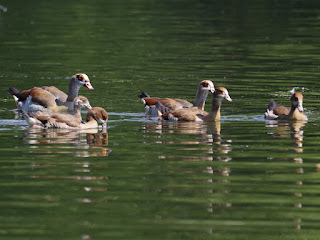 Another adopted gosling, taken in by this Egyptian family, is much younger than the others. 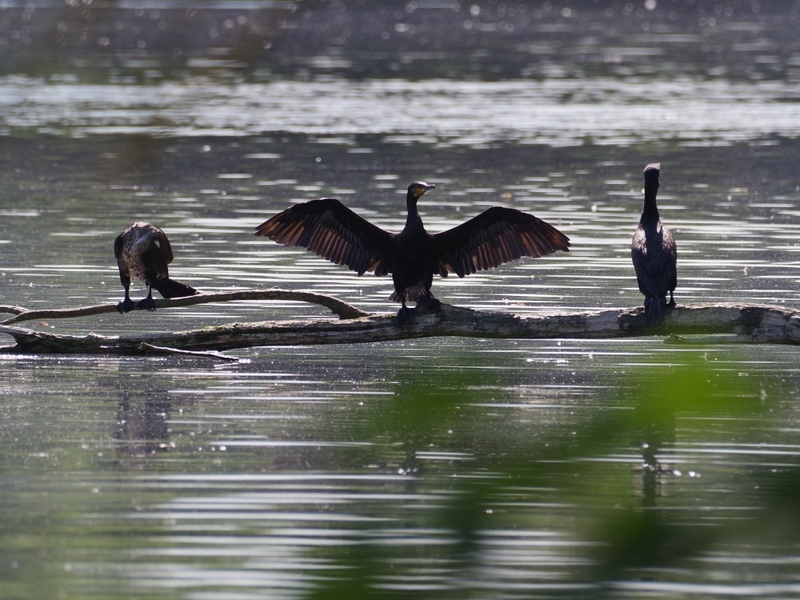 Here is a top view of one of the parents eating weed on the Long Water, showing its leg action as it swims. 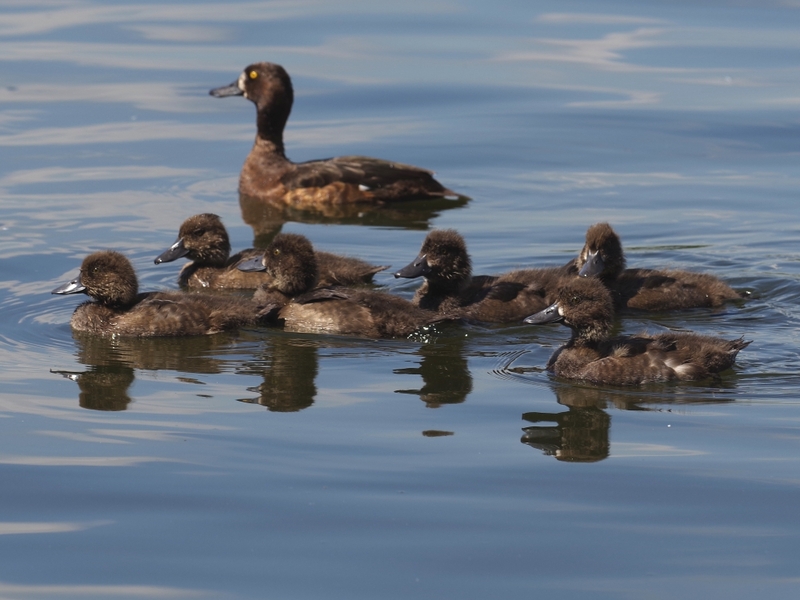 And yet another view of the big Tufted Duck family, but for me at least the active little chocolate brown ducklings remain fascinating. I think only 12 are left of the original 13. 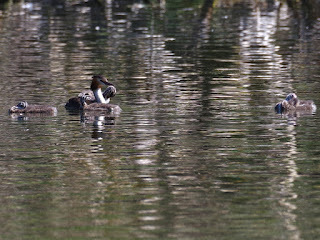 Here is the second Tufted family to appear on the lake. The six ducklings are now well grown and probably out of danger from swooping gulls. 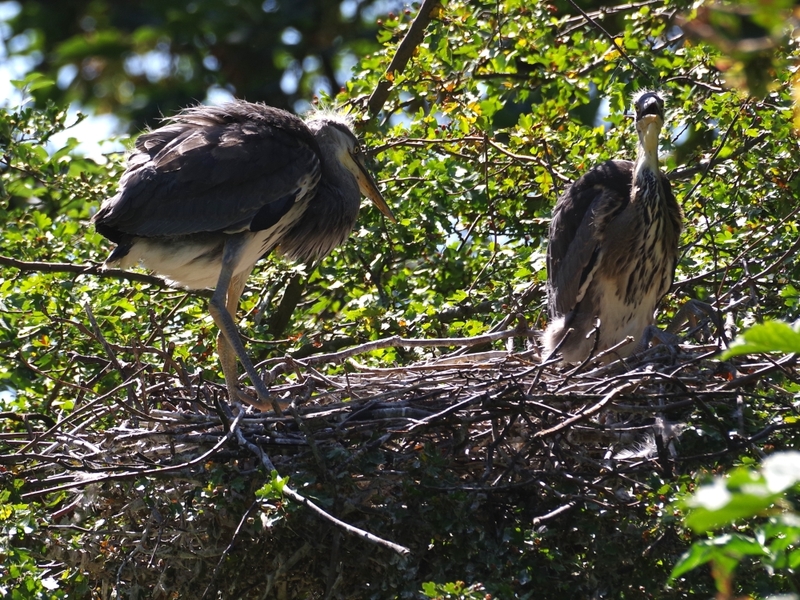 The young Grey Herons will be in their nest for a week or so yet. In all this time they have never drunk anything, getting all their water from eating fish. 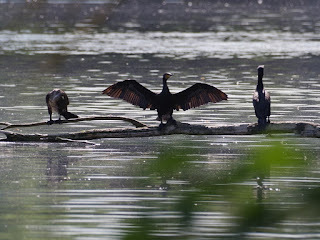 Three Cormorants lined up on a fallen tree in the Long Water. Black-Tailed Skimmers are the commonest and -- in the case of the males -- least colourful dragonfly species in the park, but still look fine with their wings glinting in the sunlight. You can see the insect's abdomen flexing as he breathes. Interesting how all the little tufties look like small female versions, I guess the males will develop their plumage colourations later on. 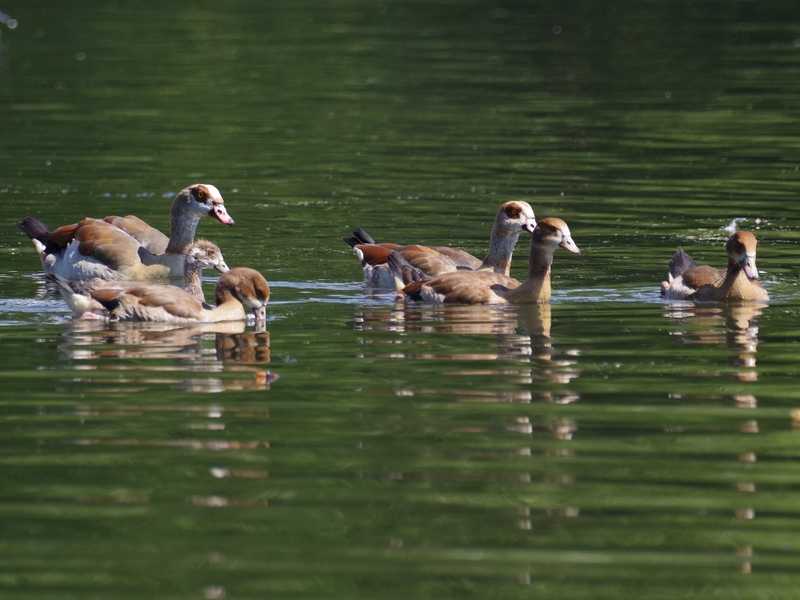 I wonder how many days old the latest brood ( 12 ) could be. 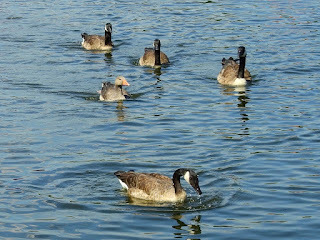 It's much the same with other ducks. The female pattern of coloration is the basic form which is disrupted when male hormones kick in. 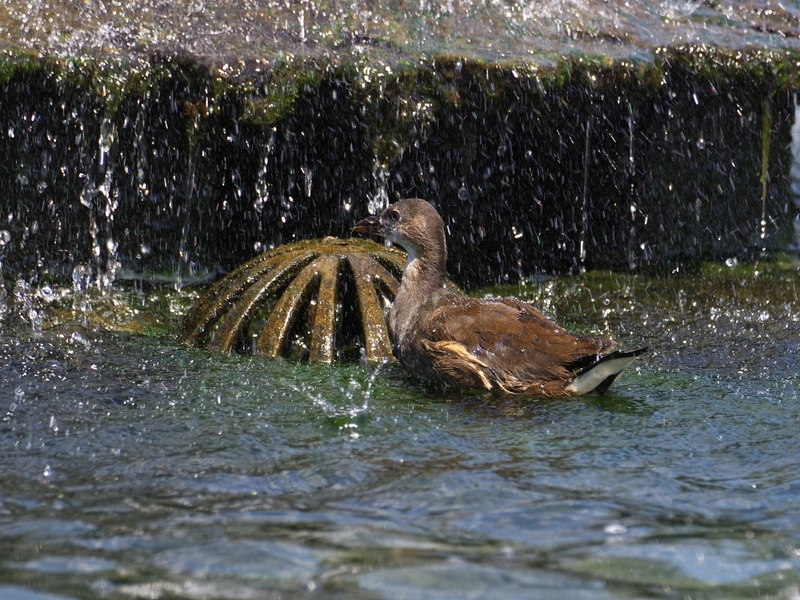 In most ducks the females have an intricate pattern which male hormones break into blocks of colour. Hi Ralph. I saw a "swooze" this week. 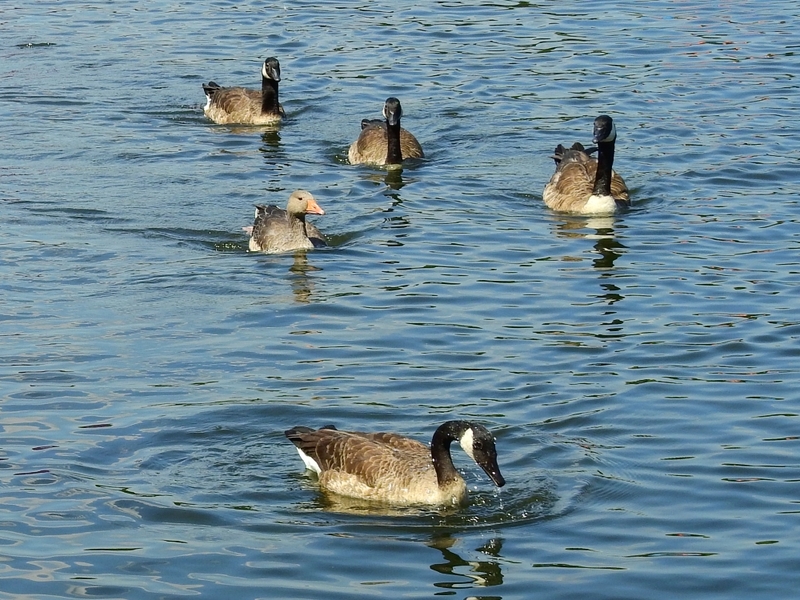 A hybrid swan/Canada Goose offspring. It was a pretty sturdy creature, sticking on the lake with mum (a swan). They are rare, apparently. If anyone wishes to view the swooze for themselves, it lives at West Green House gardens, which are very pretty in their own right. Good quiche in the tea-room too! Thanks. Have only seen pictures myself. I never tire of seeing Tufted videos. They are always doing something of interest, and even then they aren't, they are irresisitibly pretty. 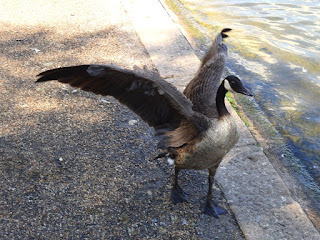 Wow, a swan/Canada goose hybrid? !I never thought such a thing existed. I hope Ralph gets good pictures!